The required cooking temperature and the method for grilling turkey depend on the thickness of the turkey meat and whether or not the skin is removed. Grilling turkey parts or slices would be done using direct heat. Grilling a whole turkey would be done using indirect heat. The cooking process known as grilling is a versatile method for cooking turkey over a high heat source, either directly or indirectly, or a combination of both. Temperatures for grilling turkey typically range from 300°F to as high as 650ºF. Several types of grilling units can be used to cook turkey. Some grills are designed for outdoor use while others are used indoors. Indoor Grills: Indoor grills provide convenience for consumers who are unable to grill outdoors because of location or climate. Many of the manufacturers of kitchen stoves offer models with built-in grills, but the most popular indoor grills are portable electric countertop units. Turkey pieces can be grilled on indoor units, but whole turkeys are too large to be cooked on indoor grills. Outdoor Grills: There are several popular methods for grilling turkey outdoors, all of which provide a flavor to the meat that is difficult to match with indoor grilling. Traditional grilling methods (which are still used) involve the use of a wood fire. A grate, supported by a stone or metal structure, is placed above the fire and the food is cooked directly on the grate. A more popular alternative is to cook turkey on grills that use charcoal as the fuel source, but the most popular outdoor grills for cooking turkey are fueled with gas. Gas grills are available in many styles, sizes, and price ranges. They are easy to use and most people like the convenience that gas grills provide. Outdoor grills must be kept away from the walls of buildings and should never be used in garages or under low hanging tree branches. Grills should be positioned in an area that is level, such as a patio or level space in a lawn, but should never be used in similar areas that may be covered with a roof. 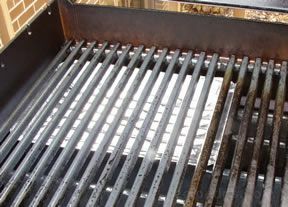 If a grill is used on a wood deck, a large piece of metal or a patio/deck protector should be placed under the unit. A grill should never be left unattended and children and pets should always be kept away from the grilling area. 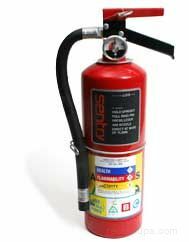 A fire extinguisher should be kept within reach at all times. 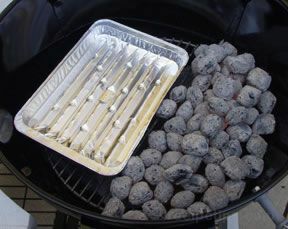 The amount of charcoal required depends on how much of the area of the grate will be used for cooking. 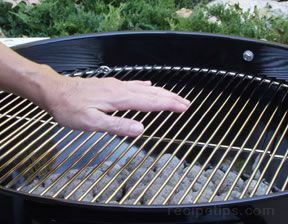 If the entire area of the grate will be used for cooking, an even layer of coals should be spread across the entire bottom of the grill. If only a portion of the grate will be used for cooking, the coals should extend about 2 inches beyond the area where the food will be cooked. 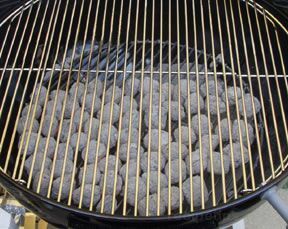 After determining the correct quantity of charcoal to use, the briquettes can be placed in a mound in the center of the grill. 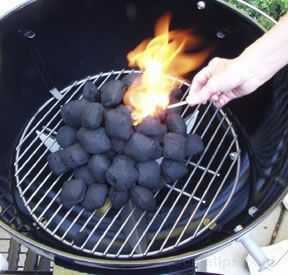 Self-lighting briquettes, containing a petroleum product for easy lighting, can be used. The coals are lit quickly with a long match. An alternative for those who do not like using petroleum products, is to use regular briquettes, which can be lit more easily with the aid of a chimney starter. Newspaper is placed in the bottom of the chimney and the charcoal is placed on top. The newspaper is lit from the bottom and the fire is drawn up to the charcoal above. 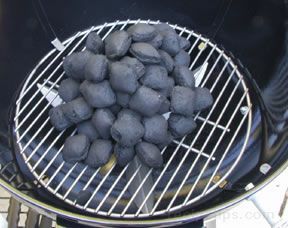 The charcoals are ready when they are glowing and are evenly coated with a layer of gray ash. This process usually requires at least 30 minutes. Many people like to add a small log or two of their favorite hardwood, such as apple or oak, to the coals in order to provide a more pronounced smoked flavor to the food. Softwoods should not be used because they burn too quickly, do not provide good flavor, and emit too much soot. 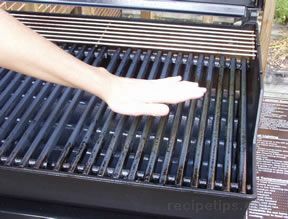 An easy method for estimating the grilling temperature is to place the palm of your hand 3 or 4 inches above the grate. The length of time you can leave your hand comfortably above the grate determines the heat intensity. 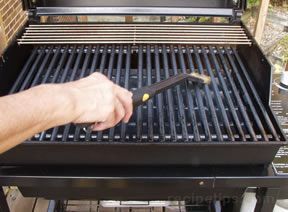 Use a long handled brush to oil the grate before grilling any food. This will help prevent food from sticking to the grate. A charcoal grill can be used for about an hour before the coals begin to die out and the heat is no longer sufficient to continue cooking. If a longer cooking time is required, the coals must be replenished. 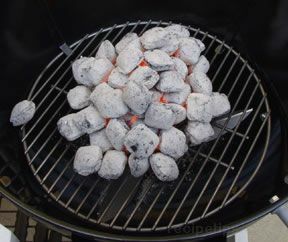 It is best to remove the grate, add the coals, and wait until they are properly lit before continuing with the cooking process. 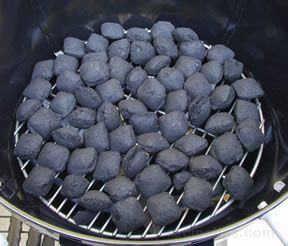 The fresh charcoal usually requires only half the length of time (about 15 minutes) to be ready than starting coals from scratch. 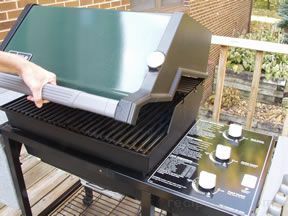 Most modern gas grills have mechanisms for automatic ignition, which makes starting the gas grill almost foolproof. One burner is usually designated as the starter burner and once it is lit, all of the other burners are lit from this source. After turning on the gas valve located on the tank below the grill unit, the burners can be lit. The control knob (for the main burner) is turned to the "start" position, to begin the flow of gas. The ignition switch is then pushed to light the burner. It is very important to open the hood of the gas grill before attempting to ignite the burners. It can be dangerous to start the burners with the hood down because gas can build up under the closed hood and may cause an explosion. Always follow the manufacturers instructions. 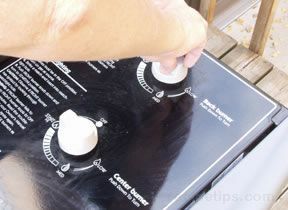 To confirm that the burner has lit, hold your hand over the grate in order to feel the heat rising from the burner. Once the main burner is lit, the other burners light automatically by simply turning on their respective control knobs to start the flow of gas. All the burners should be turned to "high" in order to preheat the grill properly. The hood should be closed while the grill preheats. 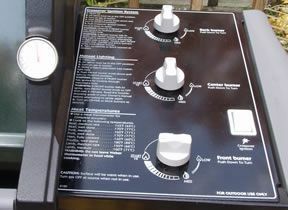 Some gas grills are equipped with thermometers built into the hoods (as shown on the right front of the hood of the grill that is pictured), which provide a reasonably accurate temperature reading when the hood is closed. When turkey is cooked with direct heat on a charcoal grill, the lit coals are usually spread in an even layer on the bottom of the grill. This provides a consistently hot, even temperature under the entire cooking surface. The cooking temperature typically reaches 450ºF to 650ºF when grilling over direct heat. Thin cuts of meat are grilled quickly over such high temperatures and should be turned only once to cook both sides. Thinly sliced turkey breast cutlets and ground turkey burgers are perfect choices for direct heat grilling. When grilling turkey with direct heat on a gas grill, all of the burners are lit to provide a hot, uniform temperature under the entire cooking surface (grate). The meat is cooked quickly over burners set on medium to high heat. Thin cuts of turkey are usually turned only once during the cooking process and are cooked with the hood down. When grilling turkey pieces or cutlets, use tongs or a spatula to turn the meat. A fork should not be used because it pierces the meat allowing juices to escape. Ground turkey patties should be turned with a spatula. The purpose of indirect heat cooking on a grill is to allow whole turkeys or thick pieces of turkey to cook thoroughly while preventing the surface of the meat from burning. Indirect heat cooking is often done in conjunction with direct heat cooking. Large turkey pieces can be seared over direct heat; then the cooking process is finished using indirect heat to slowly cook the meat to the correct doneness. Removing the skin from the whole turkey or individual pieces before grilling increases the possibility of the meat becoming too dry. The skin provides protection against excess moisture loss, so it is best to leave the skin on during grilling. The skin can be removed before serving. If the skin must be removed before grilling, the surface of the meat can be brushed with some olive oil to help keep it moist. When selecting a whole turkey for indirect grilling, it is best to choose one that is not too large. A 16-pound turkey is the largest size that is safe to grill. The grilling process does not raise the internal temperature of larger turkeys quickly enough to destroy harmful bacteria within a safe time period. A smaller turkey is also easier to handle when moving and turning it on the grilling surface. Allow 15 to 20 minutes cooking time per pound when using a covered grill. A meat thermometer should be used to make sure the internal temperature of the turkey reaches the proper degree of doneness. 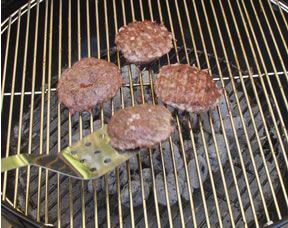 When grilling with indirect heat on a charcoal grill, the coals can be pushed to one side of the grill and a pan is placed on the opposite side. The pan is used to catch fat as it melts and drips from the meat as it cooks, reducing flare-ups. 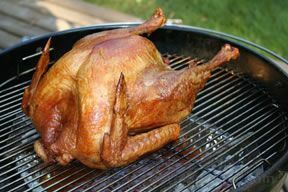 Turkey meat (pieces or whole) is placed on the section of the grill that is above the drip pan and away from the coals. 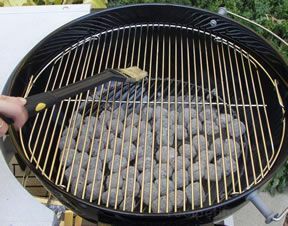 Alternate methods for arranging the coals include pushing half the coals to one side of the grill and the other half to the opposite side with the drip pan placed in between, or the coals can be placed in a ring surrounding the drip pan. The grill is covered and the turkey is cooked to the appropriate doneness. 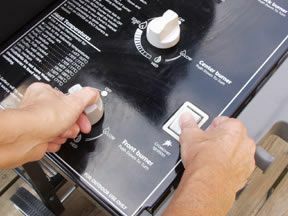 When grilling with indirect heat on a gas grill, all of the burners, except one, are turned off. For the grill pictured at right, the center and rear burners are turned off and the front burner remains lit (on high heat). A drip pan is placed on the opposite side away from the direct heat of the front gas burner and under the location where the meat will be cooked. The turkey is placed on the area of the grate over the drip pan, away from the direct heat of the front burner. The heat from the one burner is sufficient to cook the meat, indirectly, especially when the hood is closed to hold the heat within the grill.